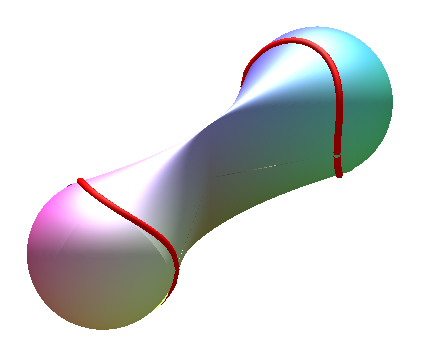 A conoid is a ruled surface the generatrices of which stay parallel to a plan (P), called directrix plane of the conoid, while intersecting a line (D), called axis of the conoid; it is therefore a Catalan surface. When (P) and (D) are perpendicular, the conoid is said to be right. A curve traced on the conoid that cuts all the generatrices is called a directrix of the conoid; there exists a unique conoid with given axis, directrix plane, and directrix. Cartesian general equation of a conoid with axis Oz and directrix plane z = mx: f(x, y, z – mx) = 0 with f homogeneous with respect to (x, y), the conoid being right for m = 0. Striction line: with (line equal to the axis for a right conoid). First quadratic form in the right case: . Cartesian equation of the conoid with axis Oz, directrix plane z = mx and directrix the curve (C) with equation f(y, z) = 0 in the plane x = a: If (C) is an algebraic curve of degree n, then the conoid is algebraic of degree between n and 2n. 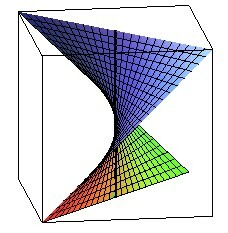 degree 3: all the ruled cubic surfaces, including Plücker's conoid, Zindler's conoid and the parabolic conoids. - the sinusoidal conoid, or Gaudi surface. equation: z = y /x. Right conoid with directrix a parabola with axis perpendicular to that of the conoid: see parabolic conoid. 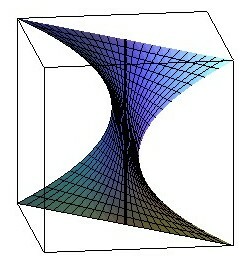 Right conoid with directrix a witch of Agnesi: Plücker's conoid. equation: z = (1 - (y/x)²)/(1 + (y/x)²). Right conoid with directrix a circle in a plane parallel to the axis: cunocuneus. The notion of directrix can be generalized to a surface: the conoid is then defined as the reunion of the lines passing by the axis, parallel to the directrix plane, and with tangents on the directrix surface. Cartesian equation: (compare to the cunocuneus: ). 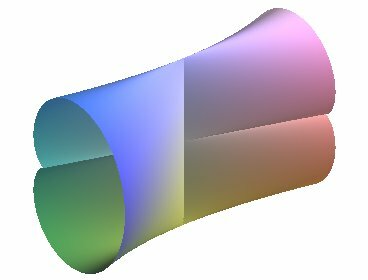 Parametrization of the tangency curve between the surface and the sphere: . 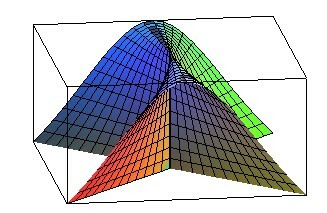 When b = a we get Plücker's conoid of order 1.
more precisely, the curve with polar equation in xOy is the projection on xOy of the intersection between the conoid and the cone of revolution . 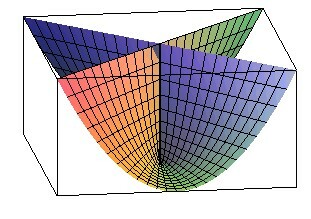 Opposite, for example, the cardioid is the projection of the intersection between Plücker's conoid and the cone of revolution . 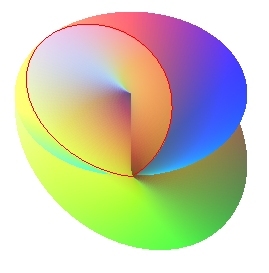 Sometimes the term conoidal surface refers to a ruled surface with two linear directrices: the conoid is then the case where one of these directrices is at infinity. 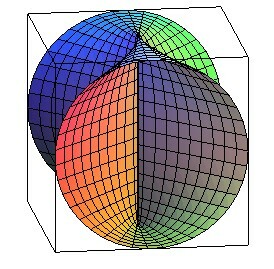 The image of a conoidal surface (and therefore of a conoid) by a homography is a conoidal surface. The milk carton is an example of such a surface.